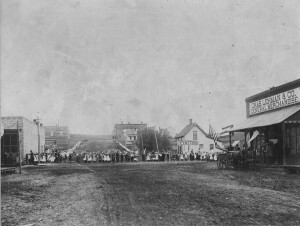 The photo above is of ladies and gents at a Main Street Celebration. It might be a celebration of the return of soldiers from the Spanish-American War as determined by the flags. The building on the left was torn down and replaced with the Bank-Electric Building (501 W Main) 1913. Adults and Children are welcome to participate in this year’s Summer Reading Program beginning June 7th. The prizes this year are awesome! What would we do without Jim Hanson who takes care of all of our carpentry projects big and small! He also helps by contributing to displays and is certainly relied upon heavily by the Friends of the Library to pull that big cart of donated books over to The Book Station sometimes daily-no matter the weather! Thank you Jim!